The number of reported cases for penal code offenses reached new post World War II (WWII) highs every year from 1996 on, peaking at 3,693,928 cases in 2002. However, the number has been decreasing every year since 2003. In 2009 the number of reported cases was 2,399,702 (down 133,649 or 5.3% from the previous year). 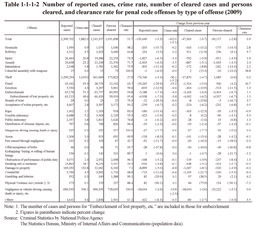 The main cause of the recent decline in the number of reported cases is that the number of reported cases for theft, which typically accounts for approximately 60% of total penal code offenses every year, has been decreasing since 2003 (See Subsection 1, Section 2). 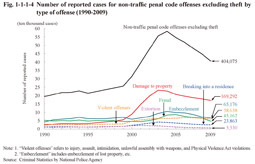 The number of reported cases for non-traffic penal code offenses excluding theft was rising until 2004, but then consistently decreased every year from 2005 through to 2009. The number of reported cases for penal code offenses has been decreasing in recent years, but examining the number of reported cases from post WWII on indicates that the number remains at a considerably high level. The crime rate for penal code offenses has basically been on the same trend as the number of reported cases. The crime rate reached new post WWII highs every year from 1998 on (at 2,127.2), peaking at 2,897.5 in 2002. It then started to decline every year from 2003 on, being 1,882.0 (down 102.0 points from the previous year) in 2009 (See Appendix 1-1). 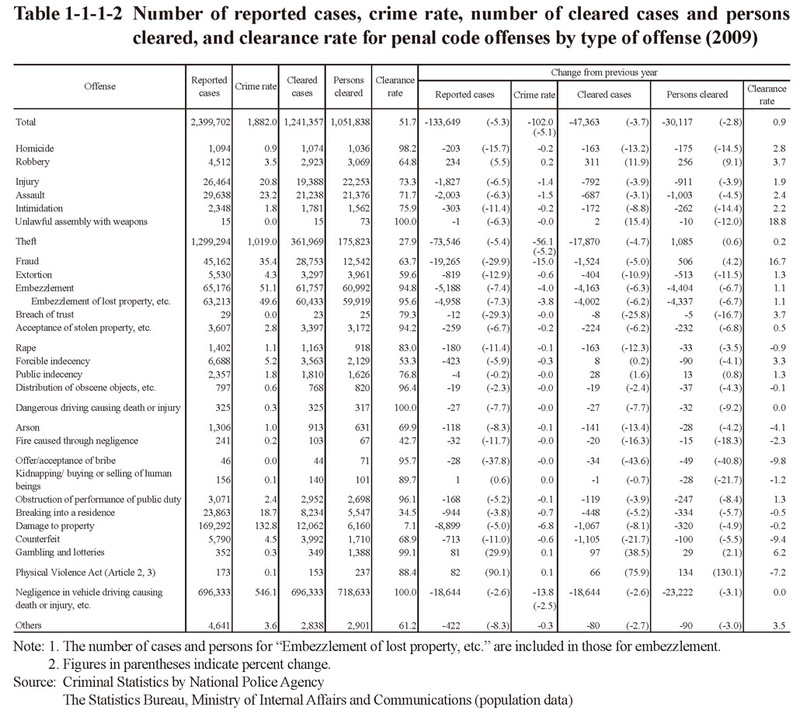 Table 1-1-1-2 shows the number of reported cases for penal code offenses and the crime rate by type of offense in 2009 and Fig. 1-1-1-3  the percent distribution of reported cases by type of offense. Examining the data by type of offense revealed that the percentage was the highest for theft at 54.1%, followed by negligence in vehicle driving causing death or injury, etc. (29.0%), damage to property (7.1%), embezzlement (including embezzlement of lost property, etc. ; hereinafter the same in this section) (2.7%), and fraud (1.9%). Fig. 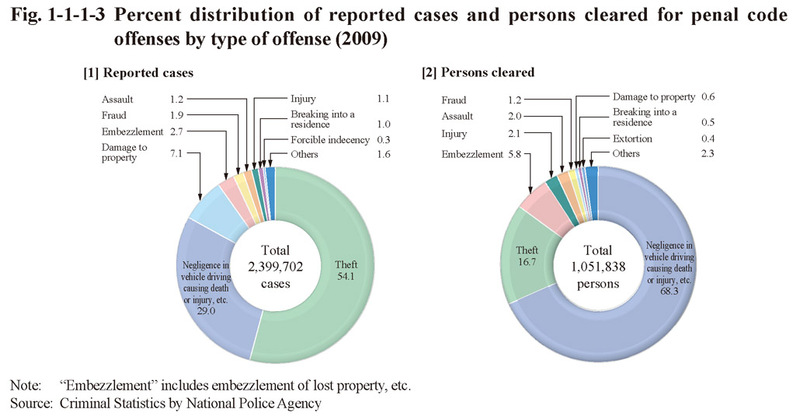 1-1-1-4 shows the number of reported cases by type of major offense, etc. for non-traffic penal code offenses excluding theft over the last 20 years. 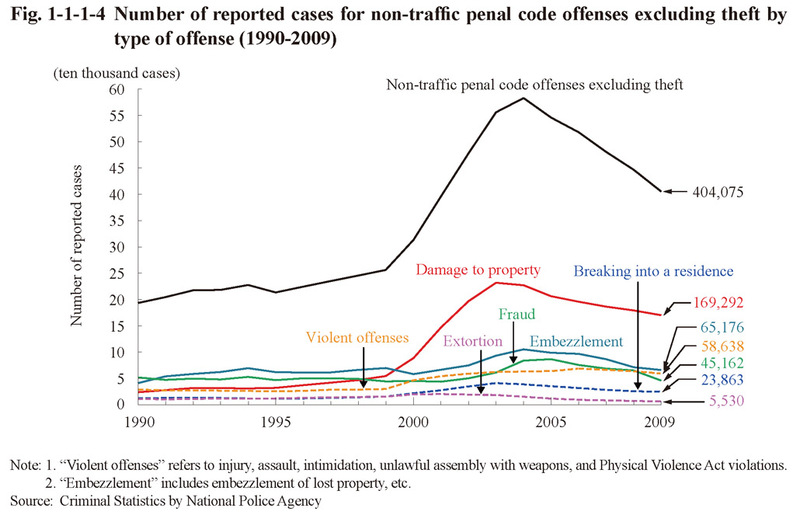 The number of reported cases for non-traffic penal code offenses excluding theft had significantly increased from 2000 to 2004. A significant increase in damage to property is considered to be the main cause of that increase.